It's becoming an annual tradition on Muni where just $2 lets you ride Muni all you want for a day. What tradition am I talking about? It's Muni's "Sunday FunDay Pass!" It's held every Sunday in the month of December. Just $2 gets you a transfer that doesn't expire until the end of the day. 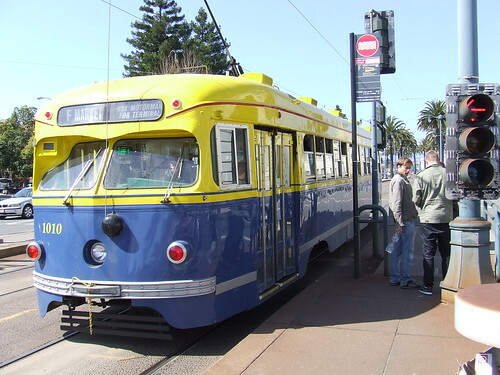 Ride as many Muni lines you like; except for the Candlestick Express and Cable Cars. And for all of you Clipper card and metro limited use ticket (LUT) users, you now get the benefit too! The initial transaction with the Clipper or LUT will automatically issue you an e-transfer valid to the end of the day. Now, how about some free parking? Maybe you don't want to haul all those nice gifts on the Muni ride home. That's right, the SFMTA's other tradition offers one or two hours of free parking too! From December 1st to 26th, and from 10AM to 6PM each day. Use one of city owned downtown parking lots listed here. At the entrance of the garage, the employee will verify your carpool and validate your ticket. If you have three people in the vehicle, you get one hour free. If you have four or more people in the vehicle, you get two hours free. Seasons greetings everyone! Remember to buy a gift for Akit! How does the Sunday FunDay Pass work with Clipper? The Muni website says not to tap the card again after the first tap. Does the operator issue a transfer or something? When you use your card the first time, you pay $2 and your e-transfer is on your card. When you use the second time on another vehicle or gate, the transfer is automatically used. But don't tag the card again on the same reader, otherwise another $2 will be charged. The third, fourth, etc. tag once at the reader and your ride is free.